Wednesday, Oct. 24, 2018, 4:30 – 6:30 p.m. 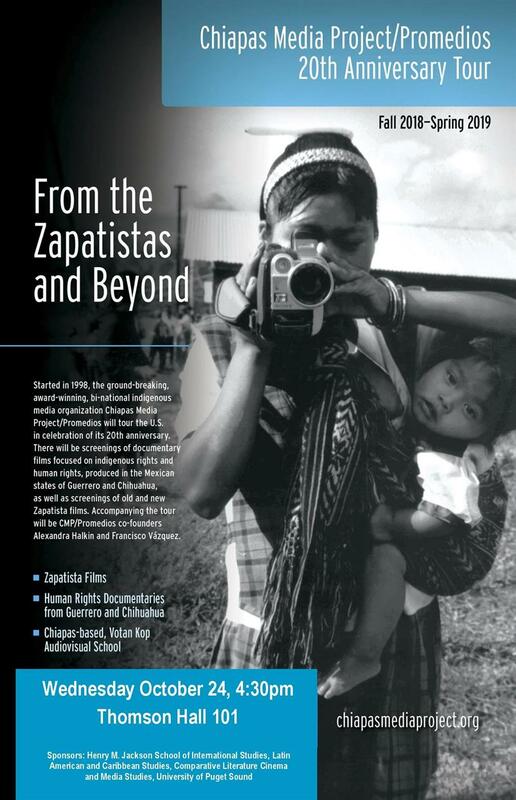 Started in 1998, the ground-breaking, award-wining, bi-national indigenous media organization Chiapas media Project/Promedios will tour the U.S. in celebration of its 20th anniversary. There will be screenings of documentary films focused on indigenous rights and human rights, produced in the Mexican states of Guerrero and Chihuahua, as well as screenings of old and new Zapatista films. Accompanying the tour will be CMP/Promedios co-founders Alexandra Halkin and Francisco Vásquez.